Let me start out by saying that I did not get paid anything to write this review. I purchased the book with my own money but I did get a 25% discount for being an Usborne Books & More consultant. I chose to buy the book and review it. Dying to Tell Me is a quick middle school read. Sasha is a cranky teenager, angry at her mother for leaving the family, angry that she has to move to the secluded country, angry that she has no friends. Her father is the new policeman so when the family moves to Manna Creek, Sasha and her younger brother are left alone to explore the tiny Australian town. Things don't go well right from the very first day-- Sasha slips running near a creek and winds up with a concussion. Someone is not happy to have a new policeman in town and tries to scare the family away. Sasha's father adopts a retired police dog to help watch over the kids while he investigates a series of art burglaries. Just when Sasha thinks things can't get weirder, she starts hearing and seeing things that no one else can. Their dog, King, winds up being more comforting than Sasha could have ever imagined. This was a really quick read--granted I was on a bus for multiple hours--with the right amount of adventure, suspense, and mystery, with a bit of supernatural thrown in. If you're a regular reader of this blog you know how I love my Australian authors (Garth Nix, Melina Marchetta) so I had a feeling I would respond to this one. Sasha's voice as a disgruntled teenager torn between her anger at her mom and her desire to make her Dad happy is authentic. 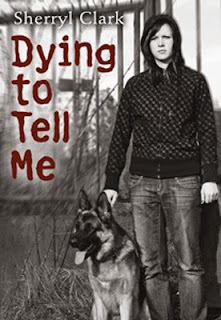 In a weird twist of coincidence, Dying to Tell Me was selected for VOYA's Top Shelf Fiction for Middle School Readers List (February 2011)-- a list that I chaired many moons ago. This was a good entertaining read that will keep middle school readers engaged.